Do you find that your belief in the supernatural is constantly under attack? As society grows ever more cynical and the mechanistic view of the universe becomes fashionable, people who believe in the supernatural are being increasingly subjected to ridicule and restraint. But what do the scientific materialists know about the Old Ways and how they can cause miraculous changes? Very little it would seem. So we thought you would like to hear true first-handaccounts from folk similar to yourselves who say they have used magic to transform their lives. It makes astonishing reading. These are a selection from the latest clutch of testimonials sent in at random by S.A. clients and tell in their own words what happened. When reading what follows remind yourself that these letters are genuine, completely unsolicited and can be verified at our head-office in Leeds, Yorkshire. Just thought I'd share some news with you after using your Health and Healing spell-kit P101. I visited my Doctor last week who told me that he had NEVER seen anyone recover so quickly from my ailment. He was utterly astonished at the speed at which the clots had stabilised and dissipated. Bearing in Mind how severely ill and close to death I was, he was expecting met to be a regular visitor to the ward, but has decided that I needn't be an in-patient again! Kind of interesting that, isn't it! I just received a letter from the I.R. stating that they will not be pursuing the case and that it is now closed. I have also been advised that my money will be re-instated. This is every thing that I had asked for in the Command Spellkit P109. I cannot thank you enough. The I.R. have been causing me such worry, stress and time since April last year. I now sleep so much easier. I gave some of your candles and Healing Oil B287 and Incense to an old Craft member who hasn't bought from you before. It's worked wonders for her so there's a recommendation for you! No, We haven't made these letters up and we haven't rewritten or exaggerated them - these are GENUINE unsolicited testimonials in the words of the people who experienced it. Dear Marabas - I love your oils! I bought some Money Oil B469 from you a while ago. There's only one thing I've got to say about it.. CHING CHING! H.D. Chicago. I used your Neighbour Ridding Oil B492 on a real bad neighbour on the end of our street 2 years back. I was a newcomer to magic but thanx to your help the rite went well. They have removed a long way off and a quiet nice couple got their home . A couple of months ago I bought Come Back to Me Oil B127 I followed the instructions as advised and within 4 days had seen and spoken to the subject, whom I had not seen for 18 months! He doesn't even live in the area. I was amazed. I found your website about a year ago and asked for a little guidance. I am visually handicapped and was being harassed by some truly rotten neighbours. After using Graveyard Oil B270 the results have been spectacular. The wife had her car demolished by an unknown person. While travelling to a family member's funeral the husband crashed his truck. There was a drug raid and the wife went to jail. Their children were pulled out of school and as a result of being away, the landlord didn't get paid, their rent subsidy was cancelled, now they are 'on the run'. Remember, these letters are true accounts, completely unsolicited and can be verified at our head-office in Leeds, Yorkshire. I just wanted to let you know that I have been giving Kombucha to my animals. So far it seems to be going well. I hvae been putting in a little with their daily drinking water and they aer taking ot okay althoug at fist they were suspicious. The Kombucha seems to be curing my 8 year old Tom cat's cataract. There is now hardly any clouding on his eye at all. Just a faint trace. All I know is that it his cataract is nearly gone (90%). All the animals have a marked improvemenst in the condition of their coats. Also their bowel movements are good and regular. Their appetites have increased and one young thin cat has put on weight. Of coruse I am also taking Kombucha myself. My skin is softer than before It seems to have healed my ankle. I tore a ligament in my right ankle a year ago. It healed but I had a LOT of pain since then. This now seems to have got 90% better. There is a little stiffness but no pain. Thanks for your help. For more information on amazing Kombucha Click here http://www.sorcerers-apprentice.co.uk/kombuman.htm . Another quick note to say many thanks for yet another success with your products. Had a most awful noisy hellbat move into the flat above, she would get up at 6am and bash and crash about until at least one or even two o' clock in the morning sometimes. Despite all requests to calm down. So I used your Stay Away Oil B663 (http://www.sorcerers-apprentice.co.uk/incenses.htm ) and overnight she's just cleared off! At first it was as if the incense was talking or communicating with me. The message I didn't understand until later was 'here comes real sorcery' Then, continuing, I felt protection had begun on the Astral, Then I saw 3 golden discs about three feet from me the upper-most being just above head height. The atmosphere was quite mind-blowing too and communicated the message that I will receive wisdom, tranquility, peacefulness with kindness to all things. This left me spending the rest of the night wondering what powers CAN be gained. You must be INCREDIBLY powerful. Its the effort that topples the rock off the mountain side but it is your incense that is the force that keeps it moving. Your All Purpose Incense B16N is in itself is a powerful lesson that I will be learning for the rest of my life. I've come to the conclusion that the S.A. don't sell occult stuff, you give it away. Two hours later when I went to bed the room was still full and strong with this atmosphere. Please thank Marabas for the Healing Spellkit script (P193P104) he sent me in 2000 for my son. It turned out to be a very rare metabolic disorder (MCAD). My son is alive and well thanks to his help. I was very pleased with the results using the Controlling Oil B137 (http://www.sorcerers-apprentice.co.uk/incenses.htm ) on my eldest daughter who was experiencing difficulty after myself and her father were going through a dreadful custody battle (which I won with your help, I believe). I used Bon Voyage Oil B84 ( http://www.sorcerers-apprentice.co.uk/incenses.htm ) on my ex husband (this worked particularly well). Lastly Conquering Oil B134 ( http://www.sorcerers-apprentice.co.uk/incenses.htm ) which worked for me as I have come through this awful time with everything I wanted. I was skeptical that anything I bought would work. As weak as I am, simply wearing the Pentacle of Baphomet P33, minor miracles have happened. I want to express my now undying devotion to your store.. .I have never met a more friendly place with which I can do business. Thank you very much. A few months ago I used the Hoxsey anti-cancer formula outlined in Marabas's OEXP047 to try to get rid of a mole on my back that had been there for some 15 or 20 years. I applied the formula on the mole daily for about a week by which time it turned hard and eventually peeled off like a scab. THIN LADY EMERGES FROM SLIMMING SPELLKIT? Your Slimming Spellkit P6114 is marvellous - it has had an amazing impact upon my life - my consciousness has completely changed around food. I'm very pleased with it. I have just done the quickie wealth attracting ritual (OEXP053) and now the wish has materialised I want a white silk to keep it safe. Let me say a big thank you for the Property Selling Oil B543 you sent me. Within 20 minutes (twenty minutes) of the oil being delivered and going onto the for sale board, the house was sold. This was a miracle. Thank You. I just love to read about people achieving their desires with magic, don't you? . If you want to read more of these heartening experiences log onto http://www.sorcerers-apprentice.co.uk/testimon.htm for even more astounding evidence from regular clients like yourself. 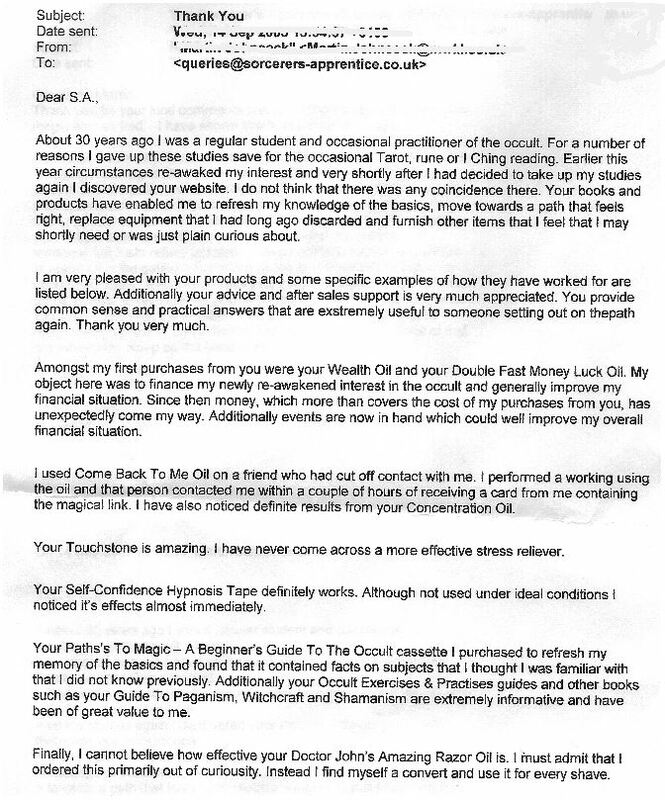 What these letters and many other glowing reports about our products show is what makes us believe that Sorcerer's Apprentice magical oils and equipment are unique in all the world and have been time-tested by satisfied clients with repeat orders for over three decades. A sure confirmation, we believe of the supreme quality and effectiveness of S.A. products. Keep this in mind when someone offers you 'discounted' magical oils and incenses which could be thrown together in bulk by a factory to fit a 'market price'. For three decades the amazing concoctions produced by Frater Marabas have, he says, changed the lives of tens of thousands of open-minded people who were willing to trust in magic. The proof of the pudding is in the eating. Sensible people just don't come back year after year after year for more supplies if what they buy doesn't fit the bill, and they don't write spontaneous from-the-heart thank-you letters like the ones above unless they are fully convinced that it happened by magic. There is only one S.A. Don't waste your time with pretenders. Genuine unsolicited testimonials included for example purposes only, others may not have enjoyed the same effect. Application suggestions given for illustration purposes only: You may need ancillary items to complete some applications. All experiments are not guaranteed and are undertaken at user's own risk. Not an intimation of increased control or influence. ON LINE:Use the hyperlinks above to go to the respective item and click on the buy-now button to add your choice/s to your shopping basket. If you are ordering from a printed version of this webpage then fire up your computer, type the hyperlinks ( e.g http://www.sorcerers-apprentice.co.uk/....etc ) into your browser window and follow through in the same way. PHONE If you have no computer then telephone 0739-7295212 (24hrs) and dictate your order to us over the phone. (COPYRIGHT NOTICE: text, trading names and products are strictly copyrighted. Extracts must not to be reproduced in whole or part without written permission from the Sorcerer's Apprentice. Want to read more real, genuine, heartwarming human stories from others like yourself who maintain that they have changed their lives with magic from the Sorcerer's Apprentice? Click here.